Victorian Pine Set of 45 Pigeon Holes. Originally there would have been a door but it has been removed (not by me) as they are far too good to be hidden. You can easily get a couple of mugs inside each pigeon hole. 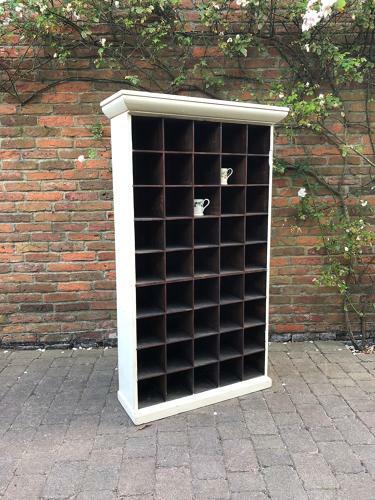 Fantastic piece in a freestanding kitchen/bar/restaurant etc...or in a hall for shoe storage. The pigeon holes are untouched the outside edge has been repainted in a cream/white.